So after a short time off due to a nasty throat infection I’m back in cigar smoking form and ready to tackle my next task. The cigar I’m smoking today is one I discovered locally through a herf I attended. After asking around online it seems some people have seen the name before but not many people have actually tried it. At the herf, I had the lucky opportunity to shake hands and chat with companies owner, Clayton. He is a very friendly and kind person who clearly shows a passion for what he does with the stories and history he talked to us about. 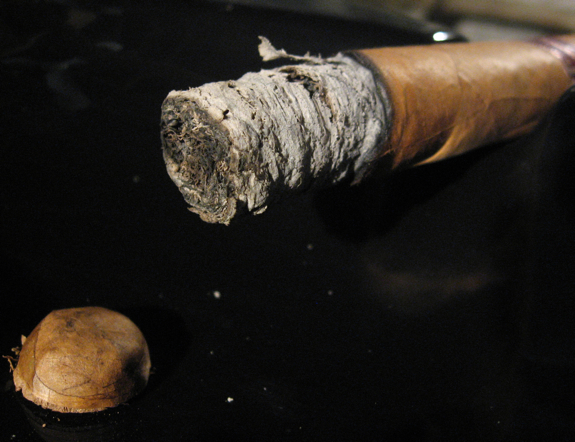 Clayton sat back with a cigar and answered all the questions we could throw at him. 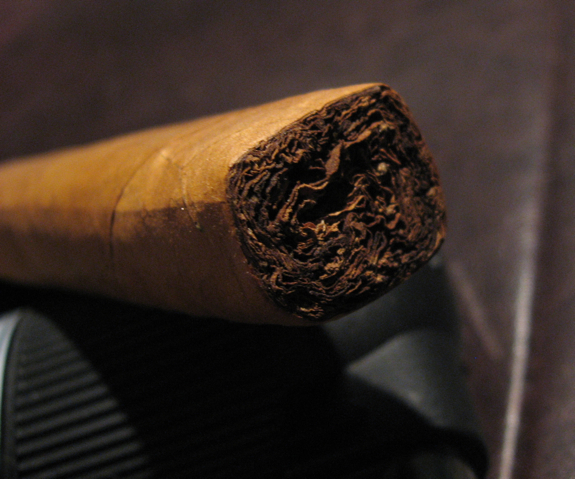 The company who makes the cigar is called Honduras Caribbean Tobacco. The Carmelo is their first cigar released a few years ago and they have recently also released a cigar carrying the companies name on the label. The Carmelo is available with a blue or red label. 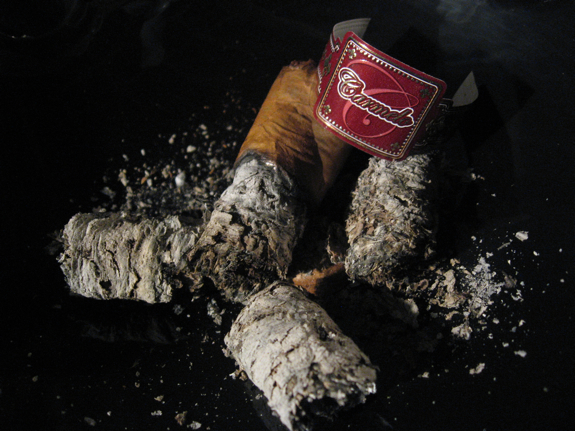 The blue label is wrapped with a Nicaraguan tobacco leaf while the red label has an Ecuadorian shade-grown wrapper. Both of the Carmelo cigars have Nicaraguan fillers and binders and are available in a variety of sizes ranging from a Carmelito (4 x 40) up to a Churchill (7×48). I’ve had the chance to enjoy a few Carmelo’s before as they are a popular mild cigar at the herf I frequent and are offered up at a fair price. The Carmelo has been around for a few years now and the company itself is still fairly young opening only in 2005. Honduras Caribbean Tobacco is headquartered in Miami and have a large tobacco field on the border of Honduras and Nicaragua. After smoking a few offerings from Honduras Caribbean Tobacco at the herf I purchased a few more to take home with me so I could write up a review. So here it is! This was a tasty mild cigar and definitely worth trying. 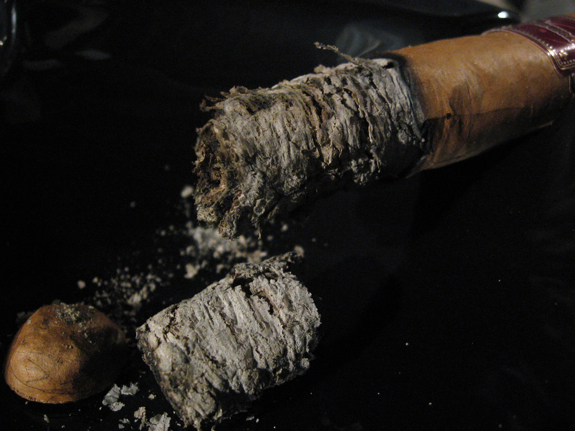 It’s not something overly complex or in your face but I don’t think that was the goal of this cigar. It’s something you can pick up anytime of the day, including the morning, and just sit back, relax and enjoy. The pine flavors in this cigar always stood out to me every time I’ve had one and is something unique that I don’t find in many cigars. I did find that they have a tendency to have burn issues if they are overly humidified but smoke perfectly when kept just under 65% or dry boxed a bit before smoking. I think this is mostly due to the delicate wrapper on these cigars but as you can see in this review, I had no issues with the burn at all even in colder temperatures. If you are looking for something different to add to your mild or morning range of cigars, pick up a few of these. They are a nice change from the typical mild Connecticut cigars. Today I’m pairing with a non-alcoholic beverage for two reasons. Firstly, I’m still taking some medication to fight this infection and I hear it’s generally a bad idea to mix alcohol with that, lol! Secondly, I’ve made the jump to enjoying some premium coffee lately and it pairs very well with cigars, especially ones in the milder range. 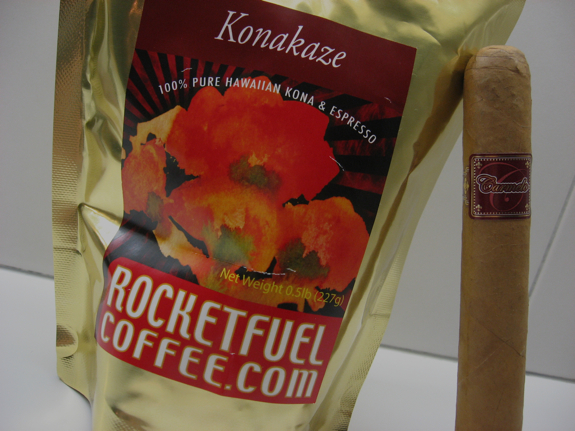 RocketFuelCoffee.com is an online coffee retailer specializing in premium gourmet coffees. they have at least 8 varieties on their website that cater to a varying audience. Don’t expect any flavored coffee here though, it’s only the all natural and tasty stuff. They even carry the infamous Kopi Luwak coffee! Check out their website and if you’re a coffee lover you won’t be disappointed. I was going to purchase this coffee online but after speaking to the owner, Lisa, on Twitter (@RcketFuelCoffee) we decided to get together and share a cigar over coffee instead since she also lives in the Great White North near Toronto. We had a great time chatting over some good coffee and cigars. One of the blends I picked up was this Konakaze blend. I love a strong bold coffee and I love espresso so she suggested this one which is a blend of Hawaiin Kona and Espresso. The coffee definitely does not disappoint, you can easily detect the bold flavor of the espresso. To compliment it perfectly, the bright and balanced flavor of the Kona brings a whole different layer to the cup. It fills your mouth with an interesting mixture that fit my coffee tastes perfectly. The coffee paired excellently with this mild cigar and the espresso notes tell me it could pair well even with some stronger offerings. 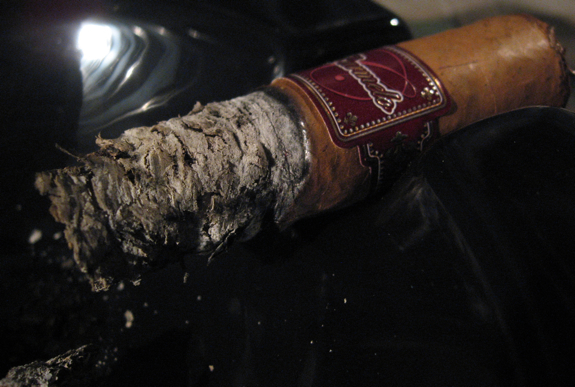 Other good pairings for this cigar would include a light beer, soda or even water. 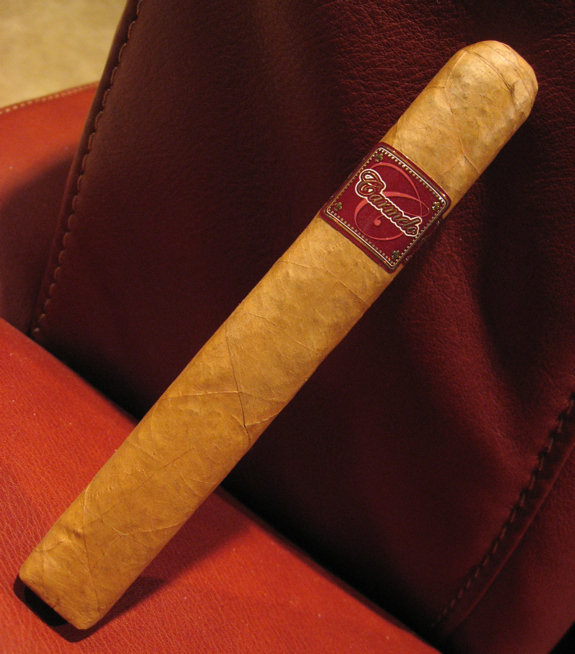 You don’t want anything too strong to overpower the cigar, get something that will let you enjoy it’s flavors. This sitre has become the king of the obscure lately….. Good stuff. Most of the recent reviews have been of smokes I haven’t heard of. Good to see you are feeling better…. Kona…. awesome! Does Lisa need an American man….? hey Daniel, i remember having the “Carmelo Red ” back in April of 2010. i had thought that it was a connecticut wrapper. i realize i was wrong on that. 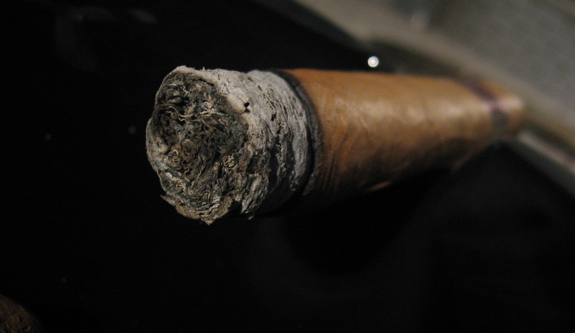 i wrote down in my cigar journal that i enjoyed the cigar(robusto size) but not to bother purchasing more of them. i guess it didn’t make a big impression on me, or maybe i had many mild cigars in my possesion already. after reading your review, i see that if i get the chance again to buy these i’ll pick up a five pack and pair it up with some expresso next time. 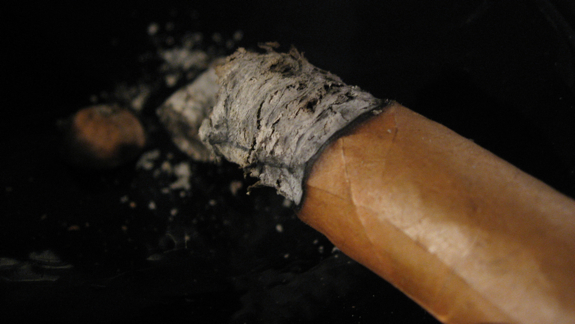 a mild cigar with a great cup of coffee on a nice Sunday morning…………………..nothing better!! Thanks Jay! These are definitely available in the US. Best I can suggest is to email or call them with the contact info on their site to find a retailer. They are pretty unique so give them a try if you can!